The key influencers of the Spending Review will be MPs. London has 73 MPs whose constituents could benefit from a positive outcome to the Spending Review. There are also many other MPs across the country with specific interests such as knife crime, domestic violence and vulnerable who will want to ensure that public services which address these issues are properly funded in future. You may already have contact with MPs as patrons or supporters. Please take any opportunities that present themselves to ensure that they fully understand the opportunities presented by the Spending Review and the impact of austerity on your beneficiaries and the people and communities you serve. 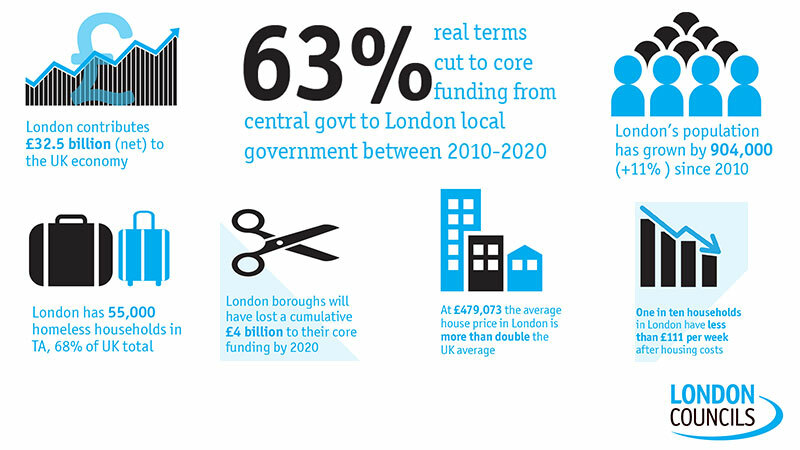 London boroughs have seen a reduction of 63% in core funding since 2010. This has had a massive impact on the voluntary sector and the people and communities they serve. The government can make an enormous difference by unleashing the potential of the voluntary sector by investing in the future. The Spending Review 2019 is a vital opportunity to address this and fully fund local services. It’s important that everyone works together – this is a cross party, cross sectoral, national effort. London Councils is working with councils across the country including Manchester, Birmingham and Nottingham; we are working with the Mayor of London and through him the directly elected Mayors in other urban areas; we are working with the business sector in London and with the voluntary sector.